Short-term container rates on the China Main ports to North Europe Main ports have seen a slight drop since the beginning of the year. However, compared to Spring and Autumn 2018, overall the industry sees an increase. Xeneta reports rates on the up, with February 7, 2019 ticking in at USD1700 market average rate for a 40' box. Also, bunker prices are not as outrageous as before. Cargo from China to the United States has been moving at a record pace, but a slowdown is expected for the main markets. There is also a probability that in the next few months the cargo volumes will slow as more Megamax ships will arrive to possibly dampen the tenuous container-availability vs containers-needed supply-demand balance. The Los Angeles/Long Beach port is setting all sorts of volume (and port-trucker gridlock) records as containers from China flood into the West Coast, and Maersk swapped two 17,800 TEU’s into that lane; replacing two 13,000 TEUs. However, this may not be due to a US economic boom. It’s speculated to be a frantic rush to beat Trump’s March 2nd tariff deadline; if a trade deal between the US-China is not reached by that date, tariffs on some 7,500 Chinese goods will increase by 25%, so importers are rushing to beat the deadline. Maersk most likely moved those ships off the China-North Europe lane because that trade was slow. Trump extended his deadline once already (in Dec 2018), but there is no guarantee it will be extended again. Economists are expecting the US economy to slow down in 2019. Goldman Sachs projected late last year that the US GDP growth will slow to 1.8 percent and 1.6 percent in the third and fourth quarters of 2019. Mega + Max: Does It Equal Love? From the advent of Maersk’s Generation-1 Megas, they, MSC, CMA CGM, OOCL, Cosco, CSCL, and United Arab, all saw megas as the most economical way to move cargo. But, now there are plenty of megas in-service, under construction, delayed, or planned, and with Asian, European, and American economic growth all slowing; more Megas hunting for cargo could cause rates to plummet on some routes. In the midst of this is HMM, who last Sept (2018) placed an order for 12 @ 23,000 TEU, and eight 15,000 TEU vessels for delivery beginning Q1 2020. This conflicts directly with that massive 2016-2017 of MegaMax new-build announcements; many of those ships have been pushed to deliver in 2019-2020; where they will compete with HMM’s new-builds for cargo. This is one of the problems with forecasting rates, as it’s difficult to get an accurate count of the megas. While the carriers and shipyards are quick to announce contracts for new vessels, delays, re-negotiations, and construction issues are not so public. While it’s true the upcoming IMO low-sulphur fuel regulations will temporarily take ships out of service as they are retrofitted; the new-builds are IMO-compliant; this is just a temporary respite of capacity until each ship is returned to their respective fleet. The resulting cascading can affect the Latin American and African markets, and it’s not too sure at all that slow-steaming and voyage blanking are serious solutions to this potential unbalance of containers vs cargo. 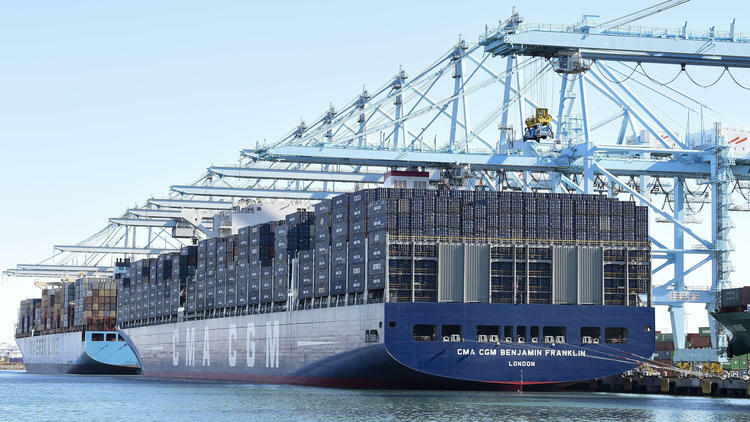 The cascading issue has already begun as the Ocean Alliance recently announced six of Cosco’s 20,000 TEU megas would service the Middle East loop beginning in April. With the price of crude oil still negatively affecting the economies of the Middle Eastern countries; whether that loop can support the volume’s needed by megas remains to be seen. Perhaps too much emphasis is spent crunching ‘fleet numbers,’ i.e. vessels in service, vessels per lane, slow-steaming times, ships scrapped, and the like. All important, to be sure, but the most important number is never really addressed: that of how many boxes need to be moved? We must also not forget that even though these new ultra large vessels are called “Megas”, the actual number of boxes carried could be lower, due to cargo weight and port draughts, as reported by Alphaliner. As always and everything in the shipping industry, there isn’t a silver-bullet answer to anything. It’s also worth noting in the midst of the US economic recovery 2013-2018, only one mega was scheduled Asia-USWC – and she was pulled quietly after only a few months. Perhaps the best fit on most big-volume lanes is a modern 15,000-17,000 TEU vessel? It remains to be seen.